In a bright, spacious meeting room at Salisbury Presbyterian Church, more than 20 singers gather to rehearse Broadway songs for their spring performance. One member of the chorus arrives late, but the moment she walks in the door, her mouth is already moving to the words of the uplifting song. Facing the chorus is an energetic and petite redhead who gestures emphatically as she conducts and shouts out praises to the singers. The singers are an older group, but this isn’t your typical senior choir. Nearly a dozen of its singers have Alzheimer’s disease or another form of dementia. Joyful Voices came to be after the church’s director of music, Dr. Mark Patterson, attended the American Choral Directors Association Conference in Minneapolis. 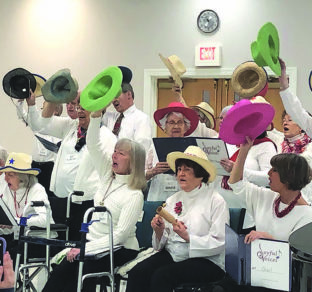 At that conference, Patterson was able to watch a performance by members of Giving Voice, which inspires organizations worldwide to provide opportunities for people with Alzheimer’s and their caregivers to sing together. When he returned to Richmond, Patterson asked locals Joanne Sherman and Laura Miles if they would serve as director and accompanist for a similar type of choir at Salisbury Presbyterian Church. “We thought about it for all of 2.5 seconds and said, ‘It would be our joy to do this,’” said Sherman, now the group’s artistic director. “Everyone is welcome,” she added. “There is no religious affiliation,” (meaning Joyful Voices is not a church choir per se). After that initial conversation, Sherman traveled to Minneapolis to talk to the directors and organizers of Giving Voice. “It was an eye-opener,” she said. “We came back enriched with lots of ideas.” Sherman then connected with the Greater Richmond Chapter of the Alzheimer’s Association and participated in a training session to develop best practices for the choir. After publicizing the group, Joyful Voices began their first rehearsal in mid-September. They welcome people at different stages of Alzheimer’s. Shirley Guistino has been bringing her mother, Marie Garand, since that first rehearsal. Both Guistino and Garand (who has Alzheimer’s) had participated in choirs in the past, so they enjoy having the opportunity to sing. Joyful Voices not only provides an opportunity for caregivers and their loved ones to bond; it also provides an opportunity for caregivers to bond with one another. While Weber’s mother enjoys singing, Weber strengthens her friendships with the other caregivers. While some caregivers choose to sing next to their loved ones, in some cases the caregivers and singers sing different parts and are therefore seated apart. As a result, the volunteer singers may be called upon as “on-site caregivers,” Sherman said, helping out when needed. “The volunteer singers are the fabric, the underlying carpet of the chorus itself,” she said. 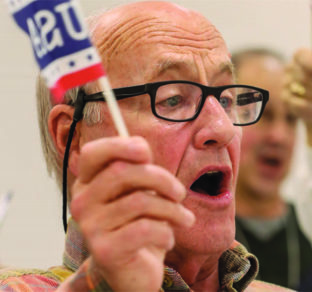 These volunteer singers, who attend every rehearsal and support Sherman in her mission, say they get as much out of the experience as they give. One such volunteer, Luana Lambert, said she doesn’t think of herself as a singer. But she loves to spend time with the other members each week. “Our voices are just a way of communicating joy, love and happiness to many,” she said. This spring, Joyful Voices will share their happiness when they give a concert in May. This will be their second public performance, and they will be singing their favorite Broadway songs. Having a performance helps to reinforce that Joyful Voices is a chorus, not a singalong. “Each week, we are challenging the singers, getting them thinking, and using those cognitive skills so they don’t lose them any more quickly than they have to,” Sherman said. Sherman expresses hope that Joyful Voices will remind those with dementia and Alzheimer’s that they can still enjoy life. “We’re hoping people will get out there, embrace this, and know they can still have a rich, fulfilling life,” she said. “Give my regards to Broadway,” the upcoming performance, will take place Thursday, May 2 in F&E Hall at Salisbury Presbyterian Church, 13621 W. Salisbury Rd. in Midlothian, Va. The concert begins at 10:30 a.m. Tickets are $10 and may be purchased by calling (301) 221-2279 or emailing audrey.fischer2386@gmail.com. For more information about Joyful Voices or to sign up, visit joyfulvoiceschorus.org. A study published in 2015 in the Journal of Alzheimer’s Disease considered the benefits of music-related leisure activities for people with mild to moderate dementia. The study, conducted by researchers from the University of Helsinki, found that singing produces benefits for working memory, executive function and orientation, particularly for those under 80 years old with mild dementia. They also found that singing helped alleviate depression, and that just listening to music provided cognitive benefits. Because music activates brain regions involved in memory, it can unlock memories connected to the songs. Singing also helps activate the part of the brain involved in retrieving long- and short-term memories, one of the last areas affected by Alzheimer’s.